British soldiers who have served in Iraq may face prosecution for crimes including murder, the head of the unit established by the Ministry of Defence to investigate allegations of torture and unlawful killing in the war-torn country has said, The Independent reports. In his first major interview, Mark Warwick, a former police detective in charge of the Iraq Historic Allegations Team (IHAT), told The Independent that he believed there would be sufficient evidence to justify criminal charges. 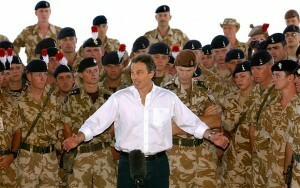 The Independent reports: IHAT’s caseload of allegations of ill-treatment or unlawful killing by British forces in Iraq between 2003 and 2009 has risen tenfold since it was established. In 2010, it was dealing with cases involving 152 victims. It is now dealing with more than 1,500 victims, according to Ihat’s latest quarterly update. Of these, 280 are victims of alleged unlawful killing by British forces in Iraq, but more than 200 of these cases have yet to be investigated, with just 25 under investigation. What about the others, especially American Soldiers? Sadly American soldiers are immune as USA does not recognise any of the International Courts. The very act of launching the war against Iraq was illegal. They had done nothing against USA or UK. The USA intelligence informed the President that there were no weapons of mass destruction in Iraq. Yet UK insisted that there were and pushed USA into a war which has resulted in the birth of Al Qaeda, ISIL and the radicalization of many Muslim countries in the Middle East. Now the whole world is bearing the fruit of their incredible stupidity. They should start with war crimes charges against Blair and Bush. Mr.Harvey Perera, Sir, how come you have read my mind word by word in your comment. It is the war mongering heads-of-state like Tony B-Liar, Bush, Cheny and others who should be prosecuted for misleading their nation and international community by sending their troops to war that was fabricated on lies and deceit. Even domestic affairs in these countries are a disgrace. We all know how twisted the criminal justice system is in many of these Western (Third Worlds) countries in which the affluent and influential can buy their innocence for the right price. For example, look at the injustice of the USA’s criminal justice system that has targeted that countries minorities and Muslims by unfair policing, wire tapping, entrapment and espionage that has led to criminalizing innocent victims. The racial discrimination, in-human policing, high-handed and selective prosecutions are a disgrace to humanity. Yet these are the very countries that preach human rights by bullying other nations outside of their own hell holes. The USA prison population is no worse than a concentration camp that is made up of their minorities while that country boast of a minority president. These nations are a DISGRACE to our word community. Had the United Nation’s been true to its word and impartial, these countries would be the first to be kicked out from the league of nations. Pot from third world Srilanka calling the kettle “Black ” . Best to join with Chinese Bubble which is about to burst. But who will investigate the arch Machiavellian architect of that ‘designer war’ Tony Blair. Well I assure you he will get off Scott free. No he did not. The rod was not hot nor long enough. A couple of low-level “chokkas” will be fed to the Lions and the matter will end there ! It is the Way of The West ! We would do well to emulate it. Hindians had already done it twice. Just after last Indo-Pakistan war 90,000 Pakistani war criminals were handed back to something called downsized Pakistan. Indra did a deal with Zulfikar Ali Bhutto hoping that Pakistani Generals including its intelligence wing were going to be her close chums. Then of course, the other war crimes committed on our soil by the IPKF. No one seems to raise this issue with Hindians. The Sri Lankan state of course had forgiven Hindian atrocities and forgotten all about it. Was it because those who suffered during the Hindian occupation were “others”? Was it because Hindian had the LTTE under its control while Sri Lankan armed forces were given licence to commit atrocities in rest of the country? Whatever the “Hindians” did to extricate themselves from the situation, if one existed, more power to them I say !! As you correctly noted, no one raised the issue either. They did not bend-over for the tear-besmirched, hair-shirt-wearing crowd. In my experience, No power (State or Non-State) – who fights a war and overpowers it’s foe, does that. Only the losing side gets shafted. Allies-vs-Axis (no war crimes by Allies. All war crimes by Axis).. US (ahem… The West) vs. Iraq, Afghanistan et al… Israel vs. everyone on Gaza.. RPF vs. (whoever they fought) and so on. Only in Sri Lanka it seems that the reverse is about to take place. I don’t see why that should be. Wars are politically decided and the armed forces comply. However, human rights, rules of engagement and the Geneva Convention decide the conduct of war. Accordingly, those soldiers who flouted these conditions, are dealt with by the justice system, in western democracies. Our generals are aware of these conditions, having attended war colleges in the west. It is their duty to ensure that rank and file comply – as they do, in foreign countries, on UN peacekeeping missions. Haaaa ! ha! ha! ha! ha! Case dropped. No further investigations!